This was my Grandfather Eddie in approximately 1920 with a wagon load of ear corn that he and his brother Walter had hand shucked and tossed into the wagon...which was the only way to harvest then. Then they had to scoop the corn from the wagon up and into the storage cribs above. The three cribs on the left are constructed from logs from trees cut down from this same farm. They are notched at each end and stacked like "lincoln logs" to build each crib. The two on the right are made from rolls of fencing which was very expensive. I believe this photo is from 1923 and is from a threshing day on my Grandparent Russell Stolte's farm. This is a very early pull type threshing unit...not sure of brand nor the make of the tractor pulling it. Our family operated orchards(primarily apples, but also peaches, pears, plums and grapes) for several generations. 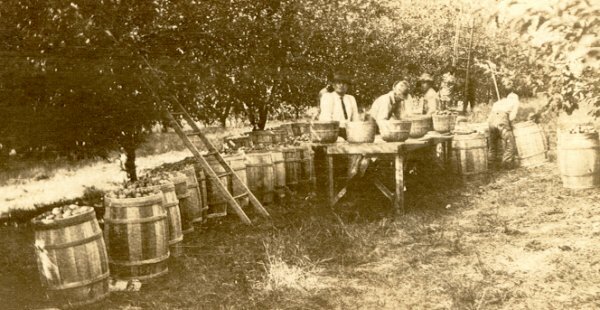 Many kinds of fruit was produced and most was packed into barrels right in the orchard. Much of the fruit was shipped downstream to St. Louis by riverboat...also barrels of salted meat, sacks of grain and shipments of firewood. I cannot tell what is being shipped on the barges attached to this riverboat as it heads upstream by us...maybe rock...maybe cordwood.